Phra Khun Paen Phong Paai Gumahn was created by Luang Poo Tim Wat Lahanlaai, District Bahn Kaai in Rayong Province. Amulets created and chanted by Luang Poo Tim are very popular and expensive because his amulets are proven to be good and experienced by many people who wore his amulets. One of the most popular amulet chanted by Luang Poo Tim is Phra Khun Paen Phong Paai Gumahn. But is very difficult to find a genuine one as there are lots of fakes one. Another name for this amulet is called Phra York Khun Pon Haeng Bahn Kaai which means the Number One in Bahn Kaai District. The making of this batch of Khun Paen followed the ancient way of making Phra Khun Paen. The ancient way of making Phra Khun Paen, in this century, only Luang Por Te, Wat Sahm Ngan and Luang Poo Tim Wat Lahanlaai have the ability to make and chant. Phra Khun Paen Phong Paai Gumahn is a kind of amulet that is very difficult to make. If it is ever created and chanted properly, the amulet possesses a lot of "power". This is because the amulet will possess the spirit of the Gumahn. A disciple of Luang Poo Tim named Kon Kulahp, who was a care-taker. One day, Luang Poo Tim asked Kon Kulahp to find a pregnant woman corpse. The condition had to be that the pregnant woman must die on Saturday and crement on Tuesday. Luang Poo told Kon Kulaph, if he ever found the pregnant woman corpse, Luang Poo asked him to removed the powder (Paai Gumahn) from the head of the child from the stomach of the woman. Kon Kulaph went alone and found what Luang Poo Tim wanted. While he was removing the powder, he must not turn his head backwards. This was the instruction from Luang Poo Tim. Kon Kulaph passed the Paai Gumahn to Luang Poo. Luang Poo Tim used special kathah to prevent the spirit leaving from the Paai Gumahn by chanting for 7 days. after 7 days, Luang Poo passed the Paai Guamhn back to Kon Kulaph and asked him to make it into more powdery by pounding on it. While Kon Kulaph was pounding on it, there was sparks that came out from the Paai Gumahn. Kon Kulaph was frightened and quickly reported to Luang Poo Tim. Luang Poo asked him to burn incense and asked for forgiveness. Then, Kon Kulaph was abled to pound it. Luang Poo Tim mixed the Paai Gumahn powder with Itije powder, Patamang powder, Prawai powder, Jindahmanee powder, 108 types of herbs powder and many other types of powder. After Luang Poo Tim had mixed the plaai Gumahn powder with the rest of the various types of powder, Luang Poo started to chant the Pra Khun Paen. Luang Poo would make a few a day, and chant them slowly in his room. There are 2 different mould in this batch of amulets; Pim Yai (Big Mould) and Pim Lek (Small Mould). The mould that was used to make the amulets followed the design of ancient Pra Khun Paen design, but with a slight differences. Luang Poo Tim called this batch of amulet as Pra Khun Paen Plaai Gumahn. The size of the Pim Yai is 3.5cm in length and 2 cm in width. 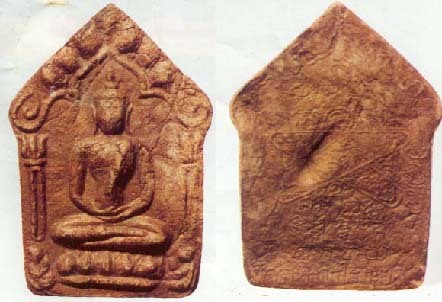 The front design of the amulet is a Buddha sitting in sammahdti. On the left and right are 2 Gumahn Tong in praying position and hands in "wai" position. At the back, is the famous Luang Poo Tim's Yan Hah that represents the 5 past Buddha (Prajow Hah Pra Ong); Na Moh Put Ta Ya. On the right is an inscription of the name "Luang Poo Tim", on the left is "Itsarigoh". Below is an inscription of the temple name "Wat Lahanlaai". The size of the Pim Lek is 2 cm in length and 1 cm in width. The front design of the amulet is a Buddha sitting in sammahdti in full lotus position. Below the Buddha is a sleeping Gumahn. On the left and right are 2 Nang Kwak, hand in "Kwak" position. The 2 Nang Kwak and a sleeping Gumahn Tong were used as part of the design because Nang Kwak is believed to give luck and the Gumahn Tong give Metta Mahahsene (loving kindness). The back of the amulet is a Yan Hah. Below the Yan Hah is the inscription "Luang Poo Tim Wat Raiwahree". Wat Raiwahree is the old name of Wat Lahanlaai. Both Pim Yai and Pim Lek, were made many times and were not made in a single day, because Luang Poo would chant them slowly once the amulet was made. The colour of each amulets has a slight different. This is due to the amulets being hand made by his disciples; different amount of powder and different pressure when his disciples pressed into the mould. But every amulets surely has the Plaai Gumahn powder, because Luang Poo Tim had personally put the Plaai Gumahn powder during the last stage of making the amulets, which is after his disciples had applied the other types of materials. If you used a magnifiying glass to look at some of the amulets, sometimes you can see red dots, hairs and even nails. Some Pim Yai, mostly the Neua Khaow(White Material), have a pair Sahligah Takruk which was inserted by Luang Poo Tim after the amulets were chanted. A layer of gold paint was applied on to the Pim Yai Neua Khaow after the insertion of the takruk. A total of 2000 pieces of Pra Khun Paen Phong Plaai Gumahn Pim Yai was created and chanted, consisted of Pim Yai with Sahligah Dtagru and Pim Yai without Sahligah Dtagru. Pim Yai with Sahligah Dtagru has around 200 pieces; some have a pair of Sahligah Dtagru and some have only one Sahligah Dtagru. Pim Lek has 5000 pieces, but without Sahligah Dtagru at all. There are around 20 pieces of Pim Lek which used the Wahn Mahahsene powder and Wahn Dtoktorng powder. These are special powder and are hard to find, especially the Wahn Dtoktorng material. The colour of Wahn Dtoktorng is light yellow in colour. The Wahn Dtoktorng Pim Lek is the best among all the other powder of this batch of Pra Khun Pae, as it believes that this Wahn Dtoktorng Pim Lek produces that best Metta, but it is hardest to find and most expensive. When Luang Poo Tim was giving out this batch of amulet, Luang Poo would give Pim Yai to the male devotees and Pim Lek to the female devotees. Luang Poo Tim ever mentioned to his close disciple, that this batch of Pra Khun Paen is very good and will be hard to find in the future. Luang Poo Tim ever mentioned that this Phra Khun Paen is good and asked people to keep it. Luang Poo supervised closely during the making this batch of amulets in the temple. Besides being proven in Metta Mahahiyom, Metta Mahahsane, it also helps one doing business , sales and success in everything you wish to do. The Pim Yai cost only 20 bahts and Pim Lek 10 bahts at that time. But now, a Pim Yai costs above a few 10,000 bahts to 100,000 bahts for a genuine piece in good condition. Pim Lek is not cheap as well, at least costs a few 10.000 bahts also. When people has good experiences while wearing this Pra Khun Paen, they related their experiences to other people. That is why this Pra Khun Paen became so popular and is in high demands because of the many good experiences that have happened to the wearers.